Lawrence Bruce Hayes was born today, March 8, in 1963. He is an American swimmer best known for anchoring the U.S. men's 4×200-meter freestyle relay team that won the gold medal at the 1984 Summer Olympics in Los Angeles. In 1992, Hayes became the first American Olympic gold medalist to come out publicly when he was profiled on ABC's World News Tonight regarding the challenges of being gay in the sports community. Born in Sarasota, Florida, and raised in San Antonio, Hayes was an outstanding Texas age-group swimmer, setting numerous records. Hayes represented the United States in several international swimming meets. He qualified in the 400-meter and 1500-meter freestyle events for the U.S. national team that won a 1981 dual meet against the Soviet Union in Kiev, Ukraine. At the 1982 FINA World Championships in Guayaquil, Ecuador, he was a finalist in the 400-meter individual medley and also contested the 400-meter and 1,500-meter freestyle events. Hayes' first national and international titles came in 1983. He won seven medals at the 1983 World University Games in Edmonton – the most by any American swimmer – and his win in the 200-meter freestyle was the only U.S. gold. His UCLA coach Ron Ballatore was quoted in Sports Illustrated about Hayes' Edmonton performance, saying, "Hayes can come home better than anyone I've ever seen." A few weeks later, he won the 200-meter freestyle at the 1983 summer United States Swimming Championships. Hayes won the 400-meter freestyle race at the 1984 winter United States Swimming Championships for his second national title. He finished third in the 200-meter freestyle at the 1984 United States Olympic Swimming Trials, qualifying him for a place on the U.S. team in the men's 4×200-meter freestyle relay in Los Angeles. In an event unaffected by the Soviet-led boycott, the Americans would battle a talented West German relay team including the 200-meter freestyle world record holder, Michael Gross. The U.S. coaches decided to capitalize on Hayes' finishing ability by having him take the final leg behind teammates Mike Heath, David Larson and Jeff Float. However Hayes knew that because his best 200m freestyle time was three seconds slower than Gross', he would need a three-second lead upon starting the relay to guarantee a win. Bruce Hayes, David Larson, Richard Saeger, and Geoffrey Gaberino of the USA's Men's 4 x200 Meter Freestyle Swimming team after the they won the gold medal at the Summer Olympic Games in Los Angeles, USA on July 30, 1984. With the U.S. ahead by one-and-a-half seconds after the third leg, Gross pulled even with Hayes after the first turn and was slightly ahead after the third. Yet, despite Gross' swimming the fastest 200-meter relay split to date, Hayes' closing strength resulted in a best personal time by more than a second, including the fastest final fifty meters ever. Hayes out-touched Gross by four one-hundredths (0.04) of a second, with the U.S. setting a world record 7:15.69. The Los Angeles media dubbed Hayes' team the "Grossbusters." Among their many media appearances was a Vanity Fair magazine cover with Raquel Welch. Capping the year, the U.S. men's 4×200-meter freestyle relay team won the 1984 Phillips Performance Award. Hayes appears in Bud Greenspan's documentary of the 1984 Los Angeles Olympic Games, 16 Days of Glory, in the segment about the race. Hayes captured one more national title before retiring when he won the 200-meter freestyle at the 1984 summer United States Swimming Championships, held after the Olympics. He subsequently earned a master's degree in journalism at Northwestern University in Chicago and then moved to New York City to begin a professional career in public relations. He joined Team New York Aquatics in 1990 and began competing again, this time in Masters swimming events. He became the first Olympic gold medalist to compete at the Gay Games when he swam at Gay Games III in Vancouver in August 1990. He came out publicly while competing, and has gone on to organize Gay Games events. "When you're famous and you come out, all of a sudden, the gay community wants to embrace you. You become a role model, and I felt there was a lot I could do on behalf of the Games. The media would listen to me because I have the credibility of being an Olympic gold-medal winner, the kind of leeway to say the Gay Games are serious competition." He became a spokesperson for the Gay Games IV in New York City in 1994. There, his swimming success continued – he set five 25-meter short course Masters world records in the 30–34 age group, including becoming the first Masters swimmer to break 4:00 in the 400-meter freestyle. He was included in Out magazine's 1994 list of the 100 most influential gays and lesbians in America. He resumed his public relations career at Edelman in New York following the Atlanta Olympics and later worked for two years in Edelman's Madrid office. In 2002, Hayes became a charter member of the Gay Games Ambassadors. He attended the Gay Games' 25th anniversary celebration in San Francisco in 2007 and presented the Federation of Gay Games' inaugural Media Award. 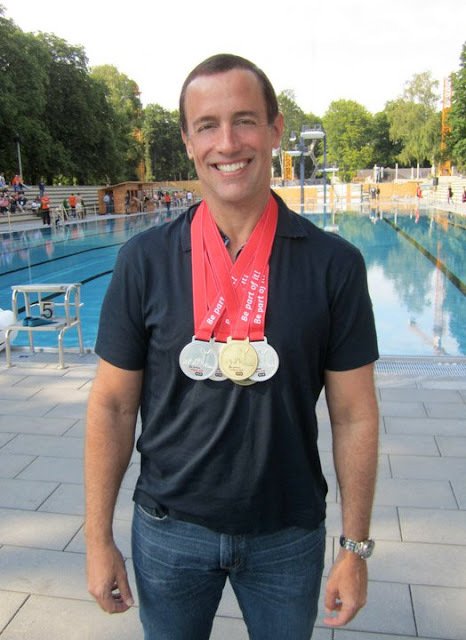 Hayes swam again at the 2010 Gay Games VIII in Cologne, Germany, winning a bronze in the 1,500-meter freestyle (age 45–49) behind Aaron Murphy (Great Britain) and Jonathan Haines (Australia).